On March 3, AmCham met with the Minister of the Economy Chiril Gaburici. 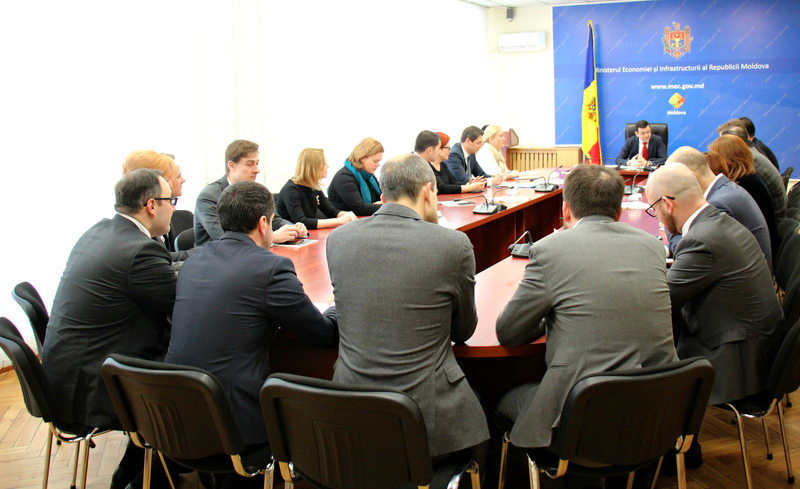 On the table for discussion were recent reforms aimed at improving the Business Climate in Moldova, legislative initiatives in the sphere of the economy, and the priorities of the ministry for the upcoming year. Free-trade agreements, Energy Security, and attracting investment are all to name but a few of this years’ priorities presented by the minister. Mr. Chiril Gaburici expressed his appreciation of the willingness shown by AmCham and local businessmen to get involved in the reviewing process and reformation of key legislation aimed at developing the most favorable business climate possible in Moldova. AmCham President Veronica Malcoci also thanked the Minister and his team for affording AmCham the opportunity to openly discuss the challenges faced by businesses and identify solutions to solve them. Last but not least, the draft law on Internal Trade, and the Law on the Promotion of Renewable Energy Sources which is to be implemented on March 25 were also discussed; alongside the modernization of the regulatory framework for the development of Catering Outlets in Petrol Stations and Free-Trade Zone Activity.